Today’s Presidential ukaz on military personnel changes is attracting attention because it relieved and dismissed General-Lieutenant Vadim Volkovitsky from the service. 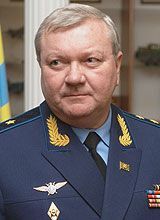 Of late Volkovitskiy was First Deputy CINC of the Air Forces (VVS), and Chief of the Main Staff. He’s a career air defender who’s been a two-star for the last ten years. He’ll be 55, statutory retirement age next Friday. He commanded air and air defense troops in the Urals in 2006, and came to Moscow and the VVS headquarters in 2007. We don’t really know why Volkovitskiy’s going out right on time, but it does seem President Medvedev and Defense Minister Serdyukov have made an effort to keep senior officers from serving forever. Far more interesting is the President relieving Colonel Vitaliy Leonidovich Razgonov, Commander of the 200th Independent Motorized Rifle Brigade based at god-forsaken Pechenga. He’s only been commander there for 18 months. 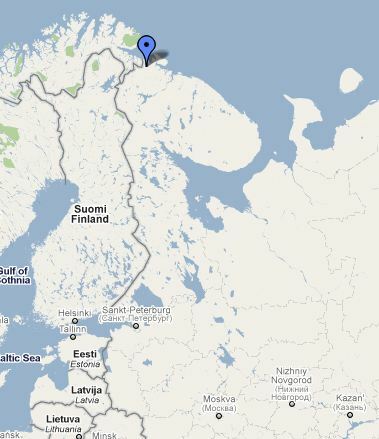 The 200th Brigade remains in its Cold War deployment along the Russian border with Norway. It’s probably not what the Defense Ministry has in mind for its future Arctic brigade. This brigade has more than its share of trouble, and Colonel Razgonov’s apparent inability to control his men might — repeat might — have something to do with the change of command. The ukaz, of course, gives no reason. Just on Monday, Komsomolskaya pravda published on all of v / ch 08275’s problems. The paper’s reporters say this command is unable to maintain elementary order. The brigade’s officers complain that today’s young men are already so corrupted that the army can’t fix them, and that they don’t have any tools to deal with disorder among their men. But KP says the soldiers don’t look disorderly during the day, but become that way at night when they’re unsupervised in the barracks. The paper suggests the officers themselves are corrupt and disorderly at Pechenga. Several weeks ago a conscript from Dagestan got three and a half years for killing an ethnic Russian junior sergeant in June 2010. The command initially tried to make it look like an accident rather than murder. Svpressa.ru suggests 4 or 5 men from Dagestan beat the victim. The Soldiers’ Mothers Committee helped his family get the military prosecutors on the case. Another conscript was beaten severely right on the brigade’s parade ground in early March. According to IA Regnum, the young man — a graduate of the Murmansk School of Music — had two operations and his spleen was removed. Last September a conscript shot and killed another conscript before shooting himself to death. The parents of the shooter don’t believe this version of what happened, and have turned to the Soldiers’ Mothers Committee for help. Last May, the chief of the brigade’s missile-artillery service stabbed his wife and six-year-old son to death. He was subsequently diagnosed as a paranoid-schizophrenic. This can happen anywhere, but it’s interesting it happened in a place already so afflicted with misfortune. One wonders if there isn’t more to the story. It’s hard to say. All the evidence of trouble is, so to say, circumstantial when it comes to Colonel Razgonov and whether he’s up to the job or has been derelict. We don’t have enough information. Maybe Razgonov himself asked to be relieved. Who knows? But it may be that someone in the chain, in the Defense Ministry or elsewhere, recognized a situation that needs to change. The question now is will it?